Lean is an often-used adjective in business these days, but there’s some confusion over its exact definition. In essence, the goal of Lean is to maximize value while minimizing waste. In other words, creating more value for the customer with fewer resources. Lean was born on the factory floor, so many people think of it as a manufacturing technique. However, that’s a misconception because every process, whether in production or services, can benefit from a Lean approach. Today, Lean is finding a home in every industry from finance to healthcare. In this article, we will demystify Lean – where it came from, how to apply it in project management today, and the management methodologies it gave birth to including Six Sigma, the Deming Cycle, and Kanban. You’ll find useful templates, worksheets, and checklists along with case studies and project examples to help guide you through your implementation of Lean. The story of Lean begins in post-World War II. Japan’s devastation during the war led to scarce equipment and resources, and manufacturers had to invent ways to thrive in a new economic environment. The United States sent consultants to Japan to help the country’s manufacturers rebuild their production capabilities. One of these experts was W. Edwards Deming, a management consultant whose ideas about quality control found more receptive audiences in Japan than they had in the United States. It was from these consultants, as well as from visits to Ford and American supermarket chains, that Japanese manufacturers, and Toyota in particular, refined the concept of Just in Time (JIT). This technique aims to increase efficiency and decrease the amount of stocked inventory by moving materials into position just before they are needed for the next stage of the production process. JIT is not used solely in manufacturing - the technique applies in any situation where a supplier delivers materials using a timeline determined by customer demand. The success of JIT depends on the ability to synchronize and coordinate steps of the manufacturing process so that materials and products are where they need to be, when they need to be there. In the 1950s, JIT, in combination with the Japanese manufacturing method of Jidoka or autonomation (automation with a human touch on an exceptions basis), would become the twin foundations of the Toyota Production System (TPS). Many consider Toyota engineer Taiichi Ohno the father of TPS and Lean. TPS was geared towards meeting the needs of the Japanese markets at the time, which called for smaller numbers of several different vehicle types. Its core principle was the systematic removal of waste in an ongoing effort to improve efficiency. The concepts of Muda, Muri, and Mura (three types of waste that are known as the 3M) are central to the idea of eliminating waste. Muda refers to activities that consume resources without increasing the end value delivered to the customer. Muri refers to practices that involve overusing equipment or overworking employees beyond reasonable or practical limits - both of which increase costs and decrease efficiency and productivity in the long run. Mura describes operational “unevenness,” which can be thought of as the irregular performance of work that increases costs and possibly decreases efficiency over time. In the 1980s, Western manufacturers discovered that Japanese companies were outperforming them. They tried emulating TPS, employing it under such names as World Class Manufacturing, Stockless Production, and Continuous Flow Manufacturing. Manufacturers also began to implement some of the Lean manufacturing techniques, though in isolation from the overarching business management philosophy. In 1988, a quality-engineer-turned-MBA-student named John Krafcik wrote an article that began a paradigm shift in American manufacturing. Krafcik, who had worked at New United Motor Manufacturing, Inc. (NUMMI), a car manufacturing company jointly owned by GM and Toyota, published Triumph of the Lean Production System based on his Master’s thesis at MIT. Scholars at MIT’s International Motor Vehicle Program continued his research into Lean production. In 1990, three scholars, James P. Womack, Daniel T. Jones, and Daniel Roos, released an international bestseller, The Machine that Changed the World, that played a hugely important role in disseminating the concept of Lean manufacturing in the West. In that book and Lean Thinking, the principles of Lean were introduced in a way that allowed Western manufacturers to understand the full extent of its benefits. The principles of Lean manufacturing, now more broadly referred to as Lean thinking, have since been adopted outside of traditional manufacturing in fields like construction, healthcare, financial services, government, project management, and knowledge work. Using Lean for knowledge work has been met with some doubt and resistance by people who argue that because the field is essentially non-replicable and non-repetitive, it is not suited to standardization. Bradley Staats and David M. Upton argue in Harvard Business Review, however, that all companies specializing in knowledge work will perform non-knowledge-based activities that are suited to waste reduction efforts. Furthermore, you can even streamline sequences of core knowledge-based activities to achieve greater efficiencies. For example, take Kanban, a Toyota practice that uses visual aids (such as signs, cards, or sticky notes) to match inventory with demand throughout the production life cycle. This makes process inefficiencies, bottlenecks, and other types of waste apparent. Kanban has been successfully used in software development, by visualizing the software development process as a production chain, identifying positions and situations that cause inefficiency in the production chain, and implementing solutions to increase the overall efficiency of the production chain. Lean has had widespread influence. For example, the Lean Aerospace Initiative was a 1992 US Air Force-funded pilot project at MIT that examined the use of Lean techniques in manufacturing aerospace products. The project was renamed the Lean Advancement Initiative until it disbanded in 2012. Healthcare, financial services, education, retail, construction, and other fields currently incorporate the principles of Lean based on the TPS. Because Lean is a paradigm that governs everything an organization does, rather than a single tactic or initiative aimed at a narrow outcome, it can be applied to a range of industry and organization-types. Ultimately, Lean transformations today focus on shifting an organization’s thinking so that it optimizes its purpose (providing greater value to the customer), process (maximizing workflow productivity) and people (how the team can best engage in continual improvement). A Project Management Institute conference paper by Aziz Moujib describes Lean project management as the application of Lean manufacturing principles to the project management process. This is in an effort to achieve the same goal: maximizing value while minimizing waste. It draws from a set of five core principles identified in the book Lean Thinking: Banish Waste and Create Wealth in Your Corporation, which was written by two of the three MIT authors who wrote The Machine that Changed the World. Standardization is another critical aspect of Lean project management. Since most projects are novel (to some extent), standardizing tasks can both improve project performance in the short term and help improve efficiencies for projects with similar tasks in the long term. Improvement of tasks in the project lifecycle tends to be incremental, leading to gradual progress towards goals. Understand Value: The first principle stresses understanding a product’s (or service’s) value in the eyes of the customer. The amount a customer is willing to pay for a product or service is directly related to how much they value it, so understanding the value of a product is the first step towards effective pricing and Lean management. Toyota, for example, adopted a top-down pricing approach defined by how much customers were willing to pay for a product with a certain value, and then focused on eliminating waste from their manufacturing processes in order to meet this price. Map the Value Stream: The value stream is the complete sequence of activities involved in delivering an end-product with an agreed-upon value, and mapping the value stream means using visualization techniques such as Kanban, flowcharts, or spaghetti diagrams to represent this flow. Toyota pioneered the technique of value stream mapping, which allows business managers and strategists to identify parts of the value stream where waste occurs, and optimize the value stream to reduce waste. A spaghetti diagram is a great starting point because it visually documents the actual flow of product, paper, and people in a workplace or project workflow. Use the template for a spaghetti diagram below to make your own. Experts recommend creating a value stream map with pencil and paper and documenting all the process steps that your product goes through, from supplier to your organization and finally to the customer. Ensure that the Value Stream Flows: The ultimate goal of value stream mapping is the preservation and optimization of flow — the rate and “evenness” with which items and information proceed through the value stream. This is the principle of JIT manufacturing in action: because excess, early, or unexpected inventory creates waste, synchronization is the key to optimizing flow. Identifying and eliminating work that adds no value (either directly or indirectly) can also improve the flow of a value stream. Employ a Pull Approach: Traditional manufacturing employed a push approach, where production targets are set based on an internally-determined schedule and production quota. This approach not very responsive to customer demand, and commonly led to production exceeding or failing to meet demand. In the first case, you would have to store the surplus product; in the second, you would have to increase the rate of production, possibly beyond optimum efficiency levels, to meet the demand. Either way, this approach creates a lot of unnecessary waste. By contrast, a pull approach allows customer demand to determine production, so that nothing is created unless a customer asks for it. Done correctly, this eliminates waste caused by inventory costs and overwork. A pull approach is, however, difficult to implement effectively because it relies on accurate, effective assessment of the market and the ability to vary production quickly and on demand. Delivery must be speedy to ensure that customer demand still exists by the time the end-product is ready. Finally, a pull approach also requires highly effective coordination of information throughout the value stream, so that everyone is aware of production requirements and inefficiencies don’t arise because of confusion and mismatched expectations. Pursue Continuous Improvement: At its heart, Lean management is an ongoing, incremental process. A waste-free system may be practically unattainable, but as a goal, it drives a need for constant improvement. The Japanese word Kaizen is often used to describe this practice in Lean. With Kaizen, the value stream is continually optimized, and defective processes are consistently improved or replaced in an effort to improve quality. Other key principles in Lean software development include amplifying learning, deciding as late as possible, delivering as fast as possible, and empowering the team. As we’ve discussed, eliminating waste is the central focus of Lean. Waste in manufacturing or construction is easy to visualize: unused resources, unnecessary effort, perhaps refuse or byproducts. For work that doesn’t involve a physical end-product, however, waste can be a little harder to visualize. What sort of waste would you imagine from, say, a software development project? TPS and traditional manufacturing identify seven types of waste (or muda in Japanese). Though these waste types were created with physical end-product manufacturing in mind, they translate well to non-physical projects, too. Let’s look at the seven types of waste, and show how they can be interpreted outside of traditional manufacturing. Overproduction: Used traditionally to refer to waste created by push manufacturing, this category covers surplus production and large inventories. Overproduction in software projects also refers to creating a product before establishing the demand for it. Overproduction may also refer to the mistake of providing functions, features, or services that the customer is not willing to pay for, which means that some of the work done on the project is unnecessary or redundant. Waiting: This term traditionally referred to the time between a product being ready to move to the next stage in a production cycle and the product actually being moved to the next stage. In manufacturing, waiting occurs because of bottlenecked processes; in soft project management you can extend that definition to include the time that information required to proceed to the next stage is unavailable. Transportation: This refers to the cost incurred and time spent physically moving a product from one place to another, especially as it is being produced. The potential costs of transportation extend beyond the time and money expended in the transportation itself, as transportation also raises the risks of damaging products. Inefficiency increases when production processes require goods to unnecessarily travel more around factories. Transportation waste is less of a problem in service projects, where communication is mostly digital and instantaneous. But inefficient paper trails and communication failures such as power outages or IT downtime are still problematic. Over-processing: In manufacturing, over-processing refers to doing work that is not needed. This could be painting areas that won’t be seen or tolerances that are tighter than required. This imposes costs related to labor, materials, and equipment wear. In service projects, over-processing takes the form of convoluted, redundant hierarchies and levels of approval, as well as the software development scenario of creating more iterations of a software product than actually needed to realize the value of the product. Inventory: In manufacturing, a push approach may result in excess inventory, which raises transportation-related waste and can consume usable space. Inventory can also prevent the identification of problems with the workflow. For service projects, inventory costs tend to be mitigated, but the excessive stockpiling of information and difficulty in retrieving information when needed are analogous. Motion: Motion-related wastes occur - in manufacturing, hard projects, and soft projects - when workers have to move too much to perform their tasks economically. Again, this is less of a problem with knowledge work, when you can quickly pull the required digital resources. Non-digital resources, however, can constitute a substantial proportion of resources used even in soft projects, and inaccessibility causes wasted motion. Defects: The problem of defects is similar for all types of work, and entails reworking and using more resources than should have been necessary. The difference lies in how defects originate. In manufacturing, defects are typically caused by faulty equipment or operator errors, while in knowledge work they stem from poor design or from inaccurate estimation. The Lean Six Sigma methodology also refers to an eighth waste: underutilized skills or brainpower. This type of waste is primarily associated with knowledge work and refers to the waste that occurs when not tapping into a worker’s full mental potential. This can occur when companies hire overqualified employees or place workers in positions where they can’t fully exercise their abilities. Failing to Establish Customer Value: Not understanding what a customer values in your project can cause you to misprice the project, and waste work and resources. When you understand the value your undertaking offers customers, you can more clearly establish project requirements, price the project according to what a customer is willing to pay, and revise work streams to meet this target price. Scope Creep: Scope creep occurs when the value of a project is increased (usually due to customer requests), but corresponding changes in budgeting and pricing don’t account for the increased value. You can avoid this problem by understanding and reevaluating value to the customer when scope changes occur, and ensuring that increased value is accompanied by a change in pricing. Failing to Define the Value Stream: Value stream mapping is an excellent way to see how project activities create value, and is vital for trimming activities that don’t create value for the project. If you do not map or define the value stream with an eye to optimizing it, non-value-creating activities may continue to strain the project budget and extend the project schedule. Lack of Stakeholder Commitment: In a perfect world, projects would always finish on time and never exceed planned cost. In reality, most projects suffer due to cost and schedule overruns, so having the stakeholder’s full backing is vital. A stakeholder who is not fully committed to the project may be less likely to extend support when a project needs to dip into its contingency reserves or request emergency funds, thus drastically exacerbating the waste creation problem. Learn more about securing and maintaining support from stakeholders in The Definitive Guide to Stakeholder Management. Now that we understand the principles of Lean thinking, we can look at how three of the main Lean methodologies—the Deming Cycle, Six Sigma, and Kanban—approach project management. They all follow a disciplined approach to project management, stress optimization of the value stream, and map the value stream in its current state. After identifying inefficiencies and waste and making modifications, a map of the value stream’s future state lays out the reengineered, optimized value stream with an improved flow. The future state can be thought of as an interim stage between the value stream as it currently exists and a hypothetical, ideal value stream. As such, value stream mapping is an ongoing process, and new measures to improve the value stream are regularly designed and implemented. At a more granular level, each of the processes that constitute the value stream are made up of a sequence of steps; you use metrics to assess the performance of these sequences. Applying Lean management principles within value stream processes can improve performance on these metrics on a micro scale and reduce waste on a macro scale. Remember that, whichever methodology you use, successful Lean projects will all seek to continually improve flow through the value stream. To do this, they streamline the flow of information, examine the value stream and its constituent processes for redundancies, and aim to simplify and standardize to reduce waste. For development projects, they may adopt a lifecycle model that uses concurrent processing in an effort to mitigate waste caused by bottlenecks. A Lean project will also adopt a pull (rather than a push) approach. This means that the customer recognizes the demand for the project before the project gets underway, and the project is completed in response to this demand. Since Lean thinking is such an overarching concept, an organization that embraces Lean management principles will usually have been successful building a culture of Lean thinking among its employees. Moreover, Lean management allocates decision-making responsibilities throughout the company hierarchy to minimize waste caused by unnecessary lengthy approvals and bureaucracy. Often, this means trusting lower-level employees and empowering them to make decisions for which they are qualified, without engaging in a wasteful review-and-approval process. The Deming Cycle, also known as A3 problem solving because it was traditionally done on sheets of A3 paper, takes its name from W. Edwards Deming, the management consultant who helped Japan rebuild their manufacturing capabilities after World War II. Deming, who is sometimes referred to as “the father of quality control,” created the Deming Cycle to facilitate the constant improvement of business processes. The Deming Cycle is also known as the PDCA Cycle or PDSA Cycle (for Plan, Do, Check or Study, and Act). Planning entails conceptualizing and designing a plan to improve a process. Doing is enacting the plan and testing its results using performance metrics. Checking or Studying involves determining whether the improvement plan was successful, and Acting is the permanent implementation of the plan to improve the business process. There’s some debate among quality gurus about whether PDCA and PDSA are the same thing, but generally any distinction is considered too minor for the average practitioner to worry about. The Deming Cycle methodology is geared towards addressing process-related problems with a single — or at least a primary — underlying cause. This cause is called the root cause, and the team in charge of improving the process will design one or more possible solutions to address this root cause. You can use this template to conduct your own root cause analysis. Practitioners also identify the current situation, or current state of the process, to determine how to best address the root cause and to identify how to change the process to target the root cause. Once you identify and target the root cause, the team will prepare a problem statement that lays out what they are trying to achieve, and establishes the metric to measure the solutions. These solutions are evaluated during the Doing and Checking phases. After conducting a cost benefit analysis to determine the optimum solution, the team recommends a plan of action to the decision-maker. To conduct your own A3 analysis, use this report template. The American Society for Quality cites as a Deming Cycle project example the Pearl River NY school district, which uses the technique for curriculum and instruction design. The school district’s planning involves the analysis of student needs to identify gaps or areas for improvement in instruction. Doing is a two-step process that involves first building a curriculum that both adheres to state and national standards and to the students’ own needs, and then actually providing the instruction. Checking involves the use of school assessments to evaluate student performance with the new mode of instruction. Finally, Acting is the implementation of curricula and instructional methods that successfully serve the students’ needs. “Throughout the school year, if assessments show students are not learning as expected, mid-course corrections are made such as re-instruction, changing teaching methods and more direct teacher mentoring. Assessment data become input for the next step in the cycle,” the case study notes. Six Sigma is a process improvement methodology that focuses on eliminating defects and minimizing variation in process outcome. It’s heavily data-driven. The name Six Sigma is a statistical reference to having six standard deviations fall between the process mean and the nearest specification limit, which effectively results in an error rate of 3.4 defects per million products or process outcomes. As such, Six Sigma’s primary goal is optimizing the consistency and precision of a process. You can read a complete guide to Six Sigma here. Six Sigma was developed by engineers at Motorola in the mid-1980s, and Motorola later trademarked the name. The technique became a cornerstone of General Electric CEO Jack Welch’s approach in the 1990s. It’s important to note that while Six Sigma and Lean are not the same, the management philosophy and the methodology complement each other very well. Lean alters processes to remove waste, and Six Sigma alters processes to improve the quality and consistency of output. As such, they both play important roles in process reengineering. The Six Sigma methodology pursues process improvement through Six Sigma improvement projects, which adopt one of the Sig Sigma sub-methodologies. We’ll discuss two of these sub-methodologies: DMAIC and DMEDI. DMAIC: This acronym (Define, Measure, Analyze, Improve, Control) is used in Six Sigma projects that aim to revamp or improve an existing business process. The define phase involves defining the scope of the problem to be examined, establishing customer requirements, and setting goals for the project. Measurement is the evaluation of the process’s current state through data collection. Analysis is the process of examining the data collected to identify the root cause. Improvement involves the use of process-improvement techniques to optimize the process, thus moving it to its future state. Finally, control involves monitoring the new, future-state process to ensure quality of output. You may repeat DMAIC until your reach the desired level of quality consistency. DMEDI: This acronym for (Define, Measure, Explore, Develop, Implement) is used in Six Sigma projects that aim to design a new process. It’s less data-driven and more creative than DMAIC. The define phase in DMEDI is similar to that in DMAIC: defining the process to be designed and the goals for the new process. Measurement is the identification of customers and their requirements. Exploration is the process of examining alternative process designs to evaluate which will best serve customer requirements. Development is the actual production of the design that is considered optimum for meeting consumer requirements. And lastly, implementation involves pilot-testing the new process to ensure that its output does indeed meet customer requirements. Deciding whether to use DMAIC or DMEDI really depends on evaluating the state of a process, if it exists at all. Conventional thinking says that DMAIC is used to improve an existing process, and DMEDI to establish a new process. In some cases, however, an existing process might be so full of problems and root causes that it’s easier to design a new process than to try and improve the existing one. If this is the case, DMEDI may be a better choice than DMAIC. Six Sigma uses a martial-art-style belt system to indicate levels of certification. The belts, in order of increasing expertise, are: White Belt, Yellow Belt, Green Belt, Black Belt, and Master Black Belt. Black Belts and Master Black Belts lead Six Sigma problem-solving projects and train others seeking Six Sigma certification. Learn more on Six Sigma certification here. Quality improvement projects rely primarily on Six Sigma methods to improve the quality of a process output. Revenue enhancing projects rely equally on Six Sigma and Lean to improve quality, reduce waste (thus increasing speed), and thus to increase company revenues. Cost savings projects rely primarily on Lean principles to cut waste from a project, making it faster, more efficient, and thus cheaper. Perhaps the most iconic Six Sigma project is one conducted at Motorola in the late 1980s, when Motorola engineers who wanted increased granularity in quality measurement switched from measuring defects per thousand opportunities to defects per million opportunities. This change in how to discuss and perceive quality would eventually lead to more than $16 billion in savings for the company via increased precision and conformance to quality requirements. Since then, Six Sigma and Lean Six Sigma methods have been implemented at thousands of organizations in the U.S., including Ford, General Electric, and the U.S. Army. Another example of the benefits of Six Sigma is Orchid, a manufacturer of artificial joints used in hip and knee replacements among other products. Their process involves lost wax casting of molds that are used to form the artificial joint from cobalt. The company found that six percent of its molds would crack, wasting the cobalt. A Six Sigma team including a plant receptionist began investigating the issue around 2010. They identified 200 variables in the manufacturing process that they speculated could contribute to the cracked molds. The receptionist noticed that there were two kinds of wax employed in the casting, virgin wax for the parts that would be in contact with surfaces implanted in the patient, and reclaimed wax for non-contact parts. Testing by the Six Sigma team found that the waxes melted at different temperatures, which could account for the cracking. They sought to verify this with 100 castings using only virgin wax. In that test, not a single mold cracked. Sixteen years earlier, the company had started using the reclaimed wax to save 60 cents a pound over virgin wax, but the decision was causing waste of cobalt that cost $7.50 to $15 a pound. The move to all-virgin wax, a variable identified through Six Sigma methods, saved Orchid an estimated $2.1 million a year. Kanban is another Lean method that originated at Toyota. This methodology focuses on eliminating backlogs of work in progress and keeping work flowing smoothly. To read how both manufacturing and software companies use Kanban, check out this reference. In an ideal factory, work would proceed at a consistent pace — sometimes termed continuous flow — and would never be bottlenecked. In reality, however, some processes are slower than others, and if these processes are downstream of faster processes, they cause backlogs. Backlogs occupy space and cost money to store, and they can conceal problems such as quality defects. Read more about Kanban in inventory management here. Toyota fixed this problem by implementing a system of visual cues — cards called Kanban cards — to indicate when a process was available to take on new work. As such, the pace of work is set by the slowest link in the production chain, which would “pull” production by using card signals to indicate when it was available to process work. As discussed earlier, the “pull” approach limits backlogging and controls bottlenecking to decrease waste. Kanban also limits the number of items being processed at any one time. The classic Kanban system is a board divided up into sections, with a number of movable cards. Each section depicts a particular process, and individual cards represent work items that move through these processes. Visual cues makes it easy to spot inefficiencies and backlogs, so Kanban can be a great way to identify processes for improvement. Given how easy and effective it is to use, Kanban is widely adopted by organizations and teams of all sizes that run multi-process production lines. Kanban is also ideal for knowledge work such as content publishing, which involves multiple processes (writing, editing, proofreading, and typesetting and printing). By using cards to symbolize individual pieces of content, you can track progress through the editorial and design chain, and allocate human resources to backlogs when they develop. You display the cards are on a Kanban board - this was traditionally a physical bulletin board but today is often created online. An impressive example of Kanban’s success comes from Moneysupermarket.com, a top U.K. comparison-shopping website that serves more than 120 million users a year. The development team was suffering from high demand, constantly shifting priorities, poor morale, and low throughput. The use of the Kanban board highlighted obvious bottlenecks and blockers, and made it clear where the team needed to focus to address problems. After implementing Kanban, the team’s lead time dropped from 120 days to 25 days, and throughput soared. Developers cleared the backlog of 469 jobs in five months. When implementing Lean, the most important thing to remember is that it is best employed as a long-term philosophy, rather than a quick fix to waste-related problems. Waste reduction is an ongoing process, and developing a philosophy of Lean thinking and consistent performance measurement ensures greater, sustained benefits over time. It also makes the application of Lean principles easier, as workers learn to recognize waste through practice. One of the ultimate goals of Lean is creating and maintaining a continuous flow of processes — where work moves through sub-processes without stopping and creating waste. To do this, organizations will implement “pull” approaches, thus drastically reducing the costs of inventory, storage, and maintenance by producing end-products on demand. In the long term, this “pull” approach leads to a more even distribution of work, which can mitigate the problems associated with overwork — for both machines and people. Of course, Lean also recognizes that flow may be interrupted not only by production processes, but also by the flow of information. Fostering a culture of strong, rapid communication is vital to the success of Lean management. Implementing tools that facilitate communication, such as Kanban, is often a necessary supplement to streamlining and improving workflows. To incorporate principles of Lean management, start with small, well-defined projects delivered to short deadlines. This is helpful for a number of reasons. For one, it teaches people to recognize waste and decide what to do about it. Additionally, it has the potential to provide quick gains through waste reduction. Since these tend to be more immediate for short projects, this can do wonders for project managers trying to develop a culture of Lean thinking in a project team. Project managers should also champion the core Lean principle of continuous improvement (Kaizen) with regard to their people and teams. Encourage continued training and learning, and project managers can obtain certifications in Lean project management, such as those offered by Villanova University and the Management and Strategy Institute. Lean project managers have developed some tools to aid in project management and organizational transformation. Some of these tools are conceptual or process frameworks, while others exist as software and systems. Value Stream Mapping: As we’ve discussed, value stream mapping plots the flow of materials and information involved in the creation of a product. Use a value stream map to analyze the current state of a value stream and to design improved future states that remove waste and create value according to customer demands. Value stream mapping was traditionally done on paper, but online tools are now available, too. Work Cells: In manufacturing, a work cell is a strategic arrangement of resources designed to improve the flow of a process and decrease waste. You may create work cell arrangements using either physical equipment or human resources, and often a combination of both. A cross-functional team is an example of a work cell based primarily on human resources, while manufacturing workspaces are an example of work cells centered on physical equipment. One-piece Flow: One-piece flow is the practice of moving work items through a work cell one piece at a time (instead of in batches), and is done mainly to decrease work in progress. Processing one work item at a time is quicker than having each worker produce batches of work before moving them to the next step (as batches take longer than single items to process, and work cannot move downstream until the entire batch is complete). Kaizen: Named for a Japanese word that roughly translates to “good change,” Kaizen is an approach to work that emphasizes incremental improvements in processes and work streams. The end goals of Kaizen are improved efficiency and higher quality. The concept encourages an organization to welcome small, easily implemented improvements that, taken together, provide major benefits in the long term. A popular way of implementing Kaizen is to start with a Kaizen Event, a short-term project (around one week) with a single, specific improvement goal. A common plan for a Kaizen Event (also sometimes called a Kaizen Blitz) assigns a function for each day such as current state documentation, current state evaluation, characterizing future state, implementing future state, and operationalizing future state. To run your own Kaizen Event, use this template to keep track of your work. 5S: A workspace organization method that organizes work-related resources in a manner that facilitates efficient, effective work. The name 5S comes from five Japanese words which, translated to English, mean sort, set in order, shine, standardize, and sustain. 5S is commonly used in Lean Six Sigma as a methodology to organize workplaces and use visual cues to achieve more consistent results. The steps involved are remove items not needed for current operations, label and arrange items so they are easy to use, keep everything tidy every day, standardize a system for keeping things in order, and avoid backsliding. While this system started in factories, it is equally relevant to offices. Try this 5S checklist in your workplace. Poka-yoke: A mechanism for error- or mistake-proofing. It helps human operators identify, prevent, or correct mistakes as they occur. The idea behind Poka-yoke is accounting for defects as they occur, minimizing waste that would otherwise be caused if defects proceeded down the production chain. Typically, Poka-yoke are divided among control and warning mechanisms. One example of a control Poka-yoke are electrical connectors designed so that they will only fit together the correct way. In a broader sense, Poka-yoke can be any technique that safety-proofs a process so it can’t be screwed up. Gemba Walk: The Gemba walk is an application of the principle of observing work as it occurs, where it occurs. It is a supplement to the Kaizen process, and is based on the idea that work processes are best observed, and thus best improved, in real time and in the actual work environment. Sometimes described as “management by walking around,” Gemba is more than a manager ambling around the office and overseeing work. In Lean, the purpose of Gemba is to observe, engage, and improve, and should occur where the most critical activity happens (the production line in manufacturing, the classroom in education, etc.). Your interactions are designed to engage the people and processes in Kaizen or continuous, incremental improvement. Obeya Room: The Obeya room, or “war room,” is a large physical space used during the development of a new product or process to facilitate interdepartmental thinking and communication. All individuals involved in the development process meet in the Obeya room to communicate and make decisions about a specific project. The Obeya room is typically furnished to facilitate discussion and problem solving, and speed up decision making. Visual Cues: The basic premise of Kanban is that it’s easier to understand and run processes visually than solely by words or numbers. As such, the use of Kanban-style visual cues (sticky notes, colored golf balls, visual control charts, or software tools that represent work items visually) is a proven way of simplifying and speeding up communication, as well as of facilitating understanding of a process. Documenting Metrics and Progress: Since Lean thinking is ultimately concerned with decreasing waste and improving flow (and typically seeks to do so incrementally), it’s vital to establish metrics that measure flow, and to consistently record performance on these metrics. You can assess flow, for example, using metrics such as work in progress, lead time, queue time, and throughput. It’s best to measure these metrics are using software tools, which can quickly determine and visualize performance via graphs or summary statistics. In software development, there’s a tendency to conflate the principles of Lean thinking with the methodologies of the Agile manifesto. So exactly how similar are they? Agile methodologies are a set of iterative development approaches designed specifically to meet ever-changing customer requirements in software development projects. The signature characteristic of an Agile project is its flexible scope, meaning that Agile methodologies are designed to easily accept and implement changes in requirements. Agile software development consists of a series of iterations, and Agile software development teams target incremental improvements in each iteration. There are some similarities between Agile and Lean project management. Both prioritize customer satisfaction - Agile through extensive customer feedback and iterations and Lean by identifying value through the eyes of the customer. Both also focus on incremental improvement, rather than big, one-time fixes. Lean is an extensive, far-reaching business philosophy that is designed to improve the efficiency of processes while eliminating waste. It results in process improvements that last for long periods and that will benefit future projects. By contrast, Agile is simply a method to ensure that a customer’s requirements for a discrete project are met quickly and efficiently. Lean principles work best when applied throughout an organization, encouraging overall efficiency and improving entire systems of processes. Agile, by contrast, targets good, quick decision making within development projects, and it is not applied outside of project work. The core principles of Lean thinking can benefit many industries and types of projects. Here are a few examples of Lean management in action. As Daniel T. Jones, one of the authors of The Machine that Changed the World and Lean Thinking, notes, the application of Lean management principles in healthcare can “deliver better quality (and safety) and a better patient experience (less queues and rework) while at the same time making better use of existing resources (to treat more patients) and improving the work experience of staff (less frustration and stress).” This, he says, is vital at a time when healthcare systems around the world face increasing stress. Hospitals are an extremely challenging but rewarding environment for Lean. They’re a distinctively complex set of interconnected processes, ranging from admissions to patient care to managing expensive, delicate facilities and coordinating medical supplies. Consistently cutting waste thus leads, in the long-term, to more cost- and time-efficient operations overall, and generally a more pleasant experience for patients. This white paper by the Institute for Healthcare Improvement details the success of Lean management at the Virginia Mason Medical Center in Seattle, Washington. By eliminating waste, Virginia Mason increased their program capacity and saved millions of dollars on expanded facilities that were no longer necessary. They also managed to reduce the number of full-time equivalents despite a no-layoff policy, due to improved processes that increased productivity and thus reduced the need to replace retired staff. The center also saw remarkable decreases in setup and lead times, floor space used, and distances traveled. The financial sector was, in general, slow to adopt principles of Lean management. However, the 2008 economic crisis drove home the importance of cost cutting simply so financial institutions could survive. As such, increasing numbers of financial institutions are turning to Lean management and discovering quite serious efficiency and waste problems in the process. Since financial institutions use customer service to differentiate themselves from competitors, Lean thinkings focus on value in the eyes of the customer has proved valuable. Banks have focused on cutting times for customer services. They’re also able to price products more attractively by cutting non-value-adding services. On the back end, banks see the expected improvements in efficiency and running costs, as well as decreased processing times for operations that shouldn’t take nearly as long to complete. By using Lean, banks often see 15 to 25 improvements in efficiency, Boston Consulting Group has found. One bank was able to process transactions 30 percent more efficiently while improving customer satisfaction with Lean, and a North American asset manager made product pricing 12 to 20 percent more efficient. According to McKinsey, a global investment bank reduced inaccuracies by 50 percent, and improved timeliness and productivity by 40 percent each. Lean principles help retailers meet the perennial challenge of inventory management. Traditionally, retail outlets have found it difficult to keep shelves stocked with items that customers want, and lose out on potential sales when they can’t do this. The solution to this challenge is a Just in Time approach similar to that used in Lean manufacturing. This means optimizing, coordinating, and scheduling transport and handling, and cutting inventory costs. At the customer-facing end, Lean management can improve the shopping experience by reducing wait times, freeing up more staff to assist customers, and ensuring that customers can find what they want. And, of course, the lower costs brought by increased efficiency may translate to more attractive pricing, which is often the bottom line for retail customers. Fast-fashion retailer Zara used Lean thinking to become one of the most lucrative retailers in the business. Among Zara’s Lean-inspired practices, JIT manufacturing allows for low inventory stocks and rapid updating of product lines, delaying commitment to particular designs until customer design preference is established, using Agile methods to quickly design fashion items according to customer preference, and the use of Kanban and One Piece Flow to quickly and accurately meet customer demand. Adoption of Lean thinking was slow in the public education sector, but there’s now an increasing appreciation of what Lean principles can bring to education. Perhaps the most fascinating application of Lean principles in education concerns education’s core function: helping students to learn. Pedagogical debates rage over the most effective ways to do this, which means that a systematic, Lean-inspired approach to identifying less effective pedagogical techniques — and recognizing the more effective ones — can help standardize the best teaching practices. Lean thinking could help close disparities in education and benefit students everywhere. The Lean Enterprise Institute reports on the success of Lean thinking in improving academic achievement at public schools in Columbus, Ohio. Using Lean tools such as process mapping and value stream mapping, the schools boosted academic achievement by reducing the time between testing and reviewing test materials to ensure that students learned and reinforced concepts more effectively. School principals adopted a more standardized approach to recording and sharing classroom observations, spotting macro trends in the process. Application of the 5S workspace organization system helped streamline processes at principals’ and secretaries’ offices. The Lean Construction Institute (LCI) sees Lean delivery as a way of responding to customer and supply chain dissatisfaction with the building industry. The LCI cites decreased productivity and efficiency in the construction industry as a driver towards Lean approaches, and uses its trademarked Last Planner System to reduce workflow variability so projects are more predictable and coordination is simpler. Lean construction, perhaps the signature application of Lean thinking in project management, focuses on core Lean principles of defining customer value, maximizing value while minimizing waste, adopting a “pull” approach, seeking continuous flow, and empowering project participants with information and decentralized decision-making authority. As an example of Lean construction principles in action, at the Ambulatory Surgery & Critical Care Tower at Akron Children’s Hospital in Akron, Ohio, a variety of stakeholders including builders, architects, doctors, nurses, and patients and their families participated in the design process. This enabled project owners to gauge value from the perspectives of multiple “customers.” Realistic simulations of the facilities based on these designs were repeatedly tested and then redesigned based on feedback. For example, the Akron Critical Care Tower purposely built private rooms for new mothers and their infants based on evidence that critically ill newborns become well enough to go home faster. In discussing the most effective and efficient ways to locate and design facilities, to store equipment and supplies, and to house patients while meeting target-cost goals, designers reduced baseline square footage by up to 20 percent on each floor. 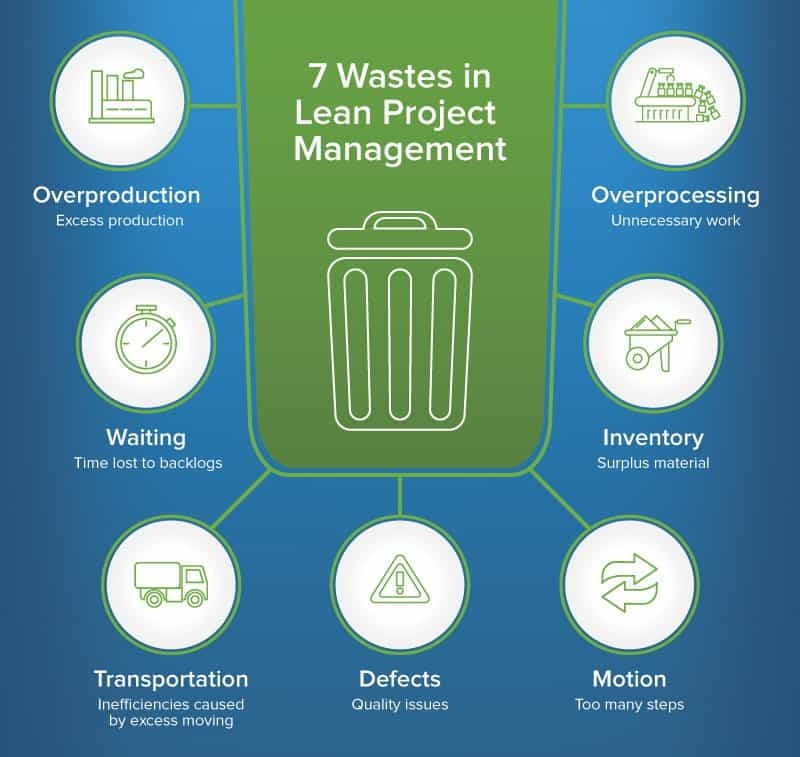 Lean project managers focus on streamlining processes and eliminating waste to effectively manage projects and keep operations moving efficiently. But even with the right processes in place, managers know it’s essential to have the right tools in place to manage the actual work. One such tool is Smartsheet, a work management and automation platform that enables enterprises and teams to work better. You can use Smartsheet to track and manage multiple processes and workflows, and to align the right people, resources, and schedules to get work done efficiently and reduce waste. With Smartsheet, you can easily create, track, and manage project plans and schedules. Assign tasks to hold team members accountable, and set automatic alerts and reminders to ensure nothing slips through the cracks. Enhance reporting with rich, real-time metrics to elevate visibility across projects and identify backlogs or bottlenecks within processes. And with Smartsheet’s multiple, flexible view-types, you can visualize your workflow in the way that works for you, be it a timeline, calendar, Kanban board, or traditional grid.